I have two favorite moments of the last two months. The WHO Country Representative (WR) in Sierra Leone is a calm Canadian Physician named Dan Kertesz. He is not a typical WR! In two months, I never saw him upset, never saw a hint of ego, and every time I saw him promote WHO it was always with an eye to how this would stop the outbreak. I accompanied him a week ago to a meeting with Save the Children (SCI) that was bound to be contentious. 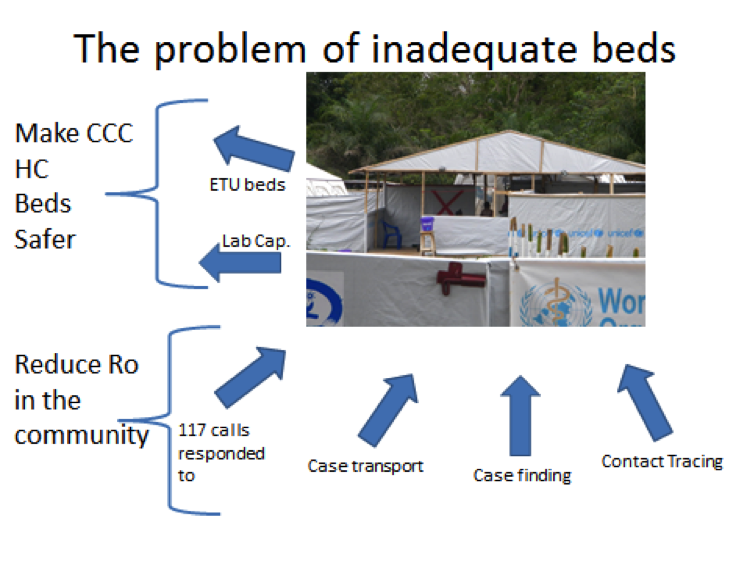 SCI had been under enormous pressure to open an 80 bed Ebola treatment facility. It was slated for opening October 24th… the date set six weeks earlier by the British Government when they announced the gift of five 100 bed facilities to Sierra Leone. All the other facilities are six to ten weeks behind schedule in opening which has been a wee bit embarrassing for DFID. As the slated opening date approached, the construction was not even close to complete so they delayed and opened just two days after construction was completed with many systems and safety measures not yet in place. By all accounts the first couple of days were chaos. It is likely on day two after opening, one of our Cuban Medical Brigade (CMB) members got infected. Between the incubation period and the investigation of the incident, our meeting with SCI was happening two weeks post opening and the facility was still in managerial disarray. There were still only ~six patients in this ~$200M 80 beds facility, and WHO was rather stressed-out because the 60 CMB members working in the facility were WHO employees… and after two weeks of operation, the facility was little safer than it had been on the day the doctor was infected. It would be an understatement to say that SCI had been uncooperative with our investigation into how the Cuban became infected. In this meeting, we wanted to get some experienced clinical support in the facility to guide the Cuban Brigade even if we had to provide it, and we wanted to change the mask and goggles that were being used in the PPE. SCI will spend ~$70,000 a day on PPE when the facility is at full capacity. The project manager that was brought-in in late October was a smart guy, retired military, probably competent as a military officer, and was very emphatic that there was a logistical mountain in the pipeline and we could not just change the PPE arrangements on a whim. We were equally emphatic that their double mask system, when wet with sweat, made it impossible to breathe. We felt that workers passing out in the Red Zone or having to lift off their masks in the Red Zone was unacceptable (and possibly was how the Cuban got infected). There came a moment when the non-medical SCI project manager became rather agitated and said to the WR, “Clearly, you have absolutely no idea what it takes to make someone safe in the Red Zone.” Given Dan’s unflappable calmness, it caught my attention when he put down his pen, leaned across the table to look more closely into the eyes of this Brit…. and he said in a completely calm voice… ”If I am completely honest here, I am finding you difficult to work with. And, I am looking for solutions.” It was a great moment because that was the perfect thing to say… he framed it as his problem, he was direct with no venom while yielding no ground. And the belligerent Brit realized he was being difficult and the negotiations improved. Had Dan used that line before? Had he heard that line? How did he grasp that moment and take it to where he wanted to go so perfectly? I contrast this with my actions in my second favorite moment of the past two months. In the Day 49 entry, I mentioned the neighbor who took the two infected teenagers out of a house being ravaged by Ebola: 14 of 16 household members became infected and 12 of them died. One of the two teens cared for by this neighbor had died and one had lived… beating the odds by a factor of two. I simply love the story of those two people and as soon as we pulled away, I was so regretful that I had not taken their picture together. Not because I won’t remember them, but because it is easier to teach a story when there is an image to go with it and I will need to teach their story… a story of regular folks transcending fear and beating the odds with compassion and a little science. Likewise, two hours earlier that day, we had been interviewing a man who had been under quarantine the month earlier and he was missing an eye and his face was swollen and there was a bloody mess where his eye should have been. As we drove away, I asked about his face and it turns out that the four households there under quarantine had risen-up against the police and he had been shot in the face with a tear gas canister. Oh what I would have given for a picture of that face when we presented our quarantine findings to the national authorities. Again, I did not capture the opportunity of the moment and regretted it afterwards. As I passed through Geneva, I gave a briefing to about a dozen of the Ebola management crowd and it must have gone well because I was later booked for a 30 minute session with the Director General (DG), Margaret Chan. In one of my classes, I make students give a presentation evaluating a surveillance system, and I force them to do it in less than 3 minutes to prepare for exactly this kind of briefing. The best student presentations almost always are the shortest. I started off telling her that I only had two points and would only speak for two minutes… and I did. The first point was that HR shortfalls were crippling the country program and the second that the numbers she is hearing of cases in Sierra Leone are gross under-estimates and I suggested some policy ramifications of this (i.e. a surveillance system evaluation). And wow, did she pick up each point and run with them. Towards the end, she asked me to write her a memo summarizing these policy conclusions (which I found flattering and have done) and the conversation was so fluid that she allowed us to run over schedule. At the end, she stood up and asked me to come with her and meet Graça Machel who had been waiting outside in the lobby for 10 minutes… first of all, it is so wrong on so many levels that anyone made Graça Machel wait because of me… but then, for Dr. Chan to grab me by the arm and march me up to Graça Machel and introduce me as one of the “heroes” of the ebola outbreak was simply pouring the surreal onto the bizarre! What a nice way to end. Finally, after weeks in the works, our MoHS surveillance partners presented our findings from three sensitivity assessments to the National Ebola Response Center… which is the national governing authority on Ebola. In one area (Bo) where the outbreak has peaked and seems under control, our little grab from 12 randomly selected villages suggested that ~54% of likely EVD events were in the national database. In the two districts with the highest incidence, this was ~26% and ~36% and there is reason to believe that if anything, these might be overestimates of sensitivity. Thus, the national numbers on cases and deaths are really two or three times worse than you hear in the press. This is completely expected if you are an epidemiologist used to working on outbreaks in Africa, but somewhat hard to imagine if you are a reporter always hungry for the next scandal. What was interesting in these sensitivity assessments was why the surveillance was so poor. Mostly, surveillance is poor because there are not enough treatment beds in the country. Above is a picture of the first Community Care Center (CCC) in the country. You can see the two tents in the background (one for dry patients, one for wet patients) behind the triage area. If there are good and rapid lab services, people who only have malaria get identified and get out quickly, reducing the chances they get ebola. If people with ebola can be confirmed quickly, ideally they will be moved to treatment units (ETU’s) before they get really symptomatic and start shedding a lot of the virus, and in doing so will reduce the chances of infecting the malaria patients in the CCCs and holding centers (HC) as well. But what really affects the surveillance, is all those measures designed to get people out of the community and isolated because those are the mechanisms associated with initial case detection. There is a national ebola emergency alert hotline (117) and a similar back-up number in most districts. In Freetown, only about three percent of alert calls trigger a household visit. Lots of them are about a dead dog in the street or are whacko calls. Often there are many calls about the same suspected case. But, there are also cases not investigated because there are no beds. In fact, in the hottest areas, lots of people reported that when they called 117, no one answered the phone. Thus, the use of 117 calls as data to monitor trends is completely undermined because there is systematic under-calling in the areas with the most Ebola. Likewise, in the most rural chiefdoms where transport cannot easily come, people and chiefs just stop calling because they know that no ambulance will ever arrive. The most central detection workers for the Viral Hemorrhagic Fever (VHF) surveillance system, case investigators and contact tracers, are likewise doing what is best for the people they encounter in the circumstances in which they exist. Why aggressively investigate a case if there are no facility beds to which one can refer them? In fact, in some areas, a case will be left at home and their family will be forced to stay 24/7 in their home with them… and there is some evidence that this kills family members compared to leaving the index case at home without quarantine. In settings with a household quarantine rule and no empty referral beds, a case investigator doing his/her job could induce ebola deaths in those they encounter… so why on earth would they do their job? Thus, an odd thing is going to happen when this outbreak peaks (which I expect in the next few weeks) and beds come on line, the surveillance system will get better and better and it will look like the numbers will be going up while they are going down. It may look bad in the newspapers, but at least it will induce less and less strain in all those case-investigators and contact tracers who will finally be able to do their job and serve the public health at the same time.